He never expected the Spanish Inquisition, but Graham Chapman apparently did expect there would be a movie about his life, so he has sort of made it himself - despite being dead for 23 years. Following its hit theatrical release, A Liar's Autobiography: The Untrue Story of Monty Python's Graham Chapman now comes to DVD to delight and surprise the legion of devoted Python lovers. Virgil Films will release the disc on February 12, 2013, with an SRP of $24.99. The man who co-wrote the immortal "Dead Parrot" sketch became himself "demised" in 1989 at age 48 from throat cancer. But in seeming preparation for this event, Chapman years earlier recorded himself reading from his book A Liar's Autobiography. Now, directors Bill Jones (son of Terry Jones), Jeff Simpson and Ben Timlett, with help from animators at 14 studios, have ingeniously turned those tapes into a hilarious, revealing and poignant look at this creative genius and complicated man. A Liar's Autobiography: The Untrue Story of Monty Python's Graham Chapman utilizes a wide range of animation techniques (some of them very Pythonesque) and new contributions from the other Pythons (and surprise guests) to tell the story of the tall, handsome, brilliant comedian. A man of deep contradictions, he lived fairly openly as a gay man at a time when that was rare, but kept his serious drinking problem in the closet. 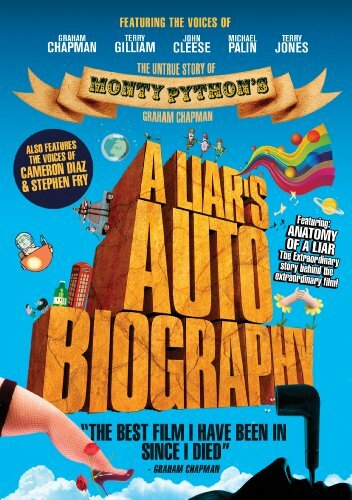 Not a documentary, not a Monty Python film, A Liar's Autobiography is Chapman's own take on his bizarre life and his search for self-knowledge. Incredible, yes. Surreal, certainly. True? Who knows? Wrote New York Post critic Kyle Smith, "The movie is a weirdly entertaining, quirky meditation about stardom, booze and '70s excess." Betsy Sherman of the Boston Phoenix called the movie "anarchic, witty, frank, raunchy and dark." The DVD boasts over an hour of hilarious video extras, including a behind-the-scenes featurette, "Anatomy of a Liar," trailers and more.